Zin! Zin! Zin! 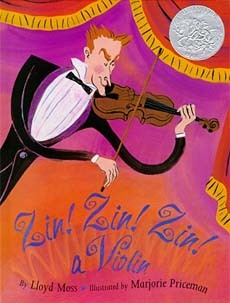 A Violin is a lively tribute to classical music and the musicians who play it with such passion. Jazzy verse, amusing characters, and alliterative sounds guide readers through ten different instruments in an orchestra. Try this one with your kids and open them up to the world of orchestra music. Moss and Priceman have accomplished a very challenging task: they've made orchestra music fun and accessible to kids! Priceman's whimsical, vibrantly colored illustrations are fantastic. In fact, PW called Priceman "a master of whimsy" and we agree! Zin! Zin! Zin! A Violin is obviously great for introducing kids to the different orchestra instruments and the musicians who play them with passion. And, it would be a lot of fun during units on poetry. Below are sample pages from Zin! Zin! Zin! A Violin. 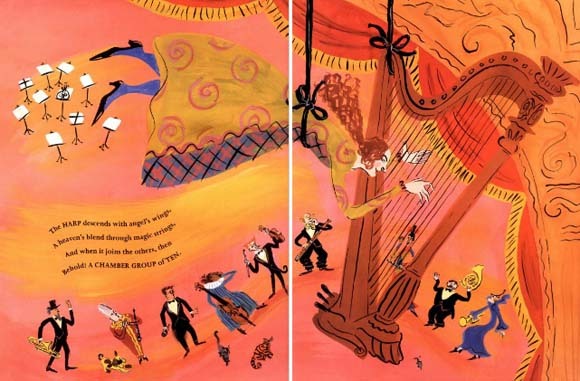 Publisher's Weekly called illustrator Marjorie Priceman "a master of whimsy". So true! Her stylish, vibrant illustrations are full of energy and are truly the definition of whimsy. 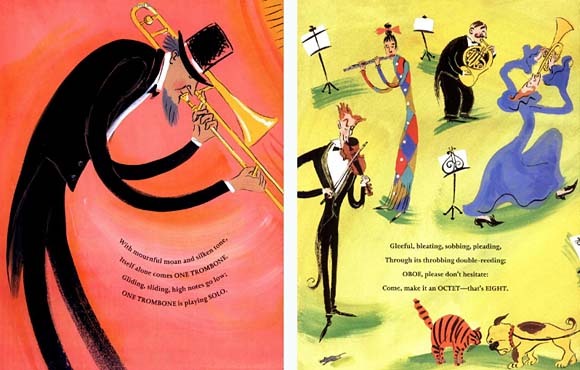 The fun color choice, the zany movements of the musicians, and the overall playful presentation help make orchestras more accessible for kids. We especially love the spread on the right. It depicts the last instrument to join the orchestra---the harp. The text on this page reads, "The HARP descends with angel's wings, / A heaven's belend through magic strings, / And when it joins the others, then / Behold! A CHAMBER GROUP of TEN." *Note: Just put your mouse on top of the instrument to get the sound. Don't click! 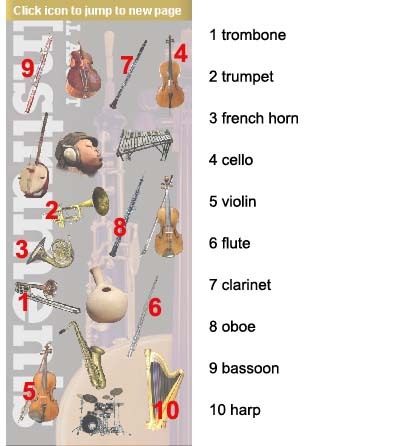 Clicking will take you to a page about that specific instrument. For this activity you want to stay on this page. We love Marjorie Priceman's illustrations. Everyone does! 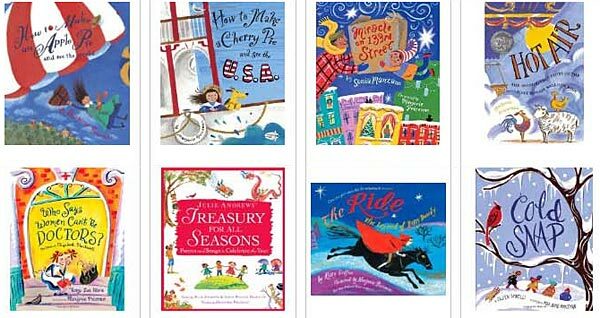 In fact, several have won Caldecott Awards (the most prestigious award in children's literature). Be sure to check our other books by Marjorie Priceman.